Once his fame had been established, Mike began a career of touring sideshows in the company of such other creatures as a two-headed baby. He was also photographed for dozens of magazines and papers, and was featured in Time and Life magazines. Mike was put on display to the public for an admission cost of 25 cents. At the height of his popularity, the chicken's owner earned US$4,500 per month ($50,500 today); Mike was valued at $10,000. It was determined that the axe had missed the jugular vein and a clot had prevented Mike from bleeding to death. Although most of his head was severed, most of his brain stem and one ear were left on his body. Since basic functions (breathing, heart rate, etc.) as well as most of a chicken's reflex actions are controlled by the brain stem, Mike was able to remain quite healthy. This is a good example of central motor generators enabling basic homeostatic functions to be carried out in the absence of higher brain centres. Mike the Headless Chicken was an inspiration for the poultry-themed comedy punk band The Radioactive Chicken Heads, serving as the subject of their 2008 song "Headless Mike", for which a music video was filmed. The band also features a Headless Mike puppet which is frequently used in their live shows. ^ a b "Mike's Story". Mike the Headless Chicken. 2007. Retrieved May 28, 2012. ^ a b "The chicken that lived for 18 months without a head". BBC News Online. September 10, 2015. Retrieved September 12, 2015. ^ a b c d Lloyd, John; Mitchinson, John (2006). The Book of General Ignorance. Faber and Faber. ISBN 0-571-23368-6. ^ "The Rooster". Time Inc. October 29, 1945. Retrieved November 13, 2008. ^ "Beheaded Chicken Calmly Lives On". Salt Lake Tribune. September 19, 1945. p. 17. Retrieved September 10, 2018 – via Newspapers.com. ^ "Mike the Headless Chicken Day". salon.com. Retrieved October 28, 2008. ^ "The Radioactive Chicken Heads - "Headless Mike"". Funny or Die. Amy Reiter (1999). "Mike the Headless Chicken more popular than Clinton". Salon. Retrieved March 8, 2008. Charles Furneaux, executive producer; Gregory Diefenbach, producer; Mark Lewis, producer (2001). The Natural History of the Chicken (Video). PBS Home Video. Retrieved October 11, 2013. Silverman, Steve (2001). Einstein's Refrigerator: And Other Stories from the Flip Side of History. Kansas City, Missouri: Andrews McMeel Publishing. ISBN 0-7407-1419-8. 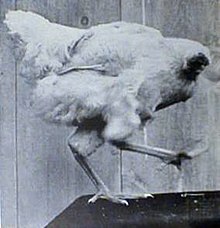 Wikimedia Commons has media related to Mike the Headless Chicken.